The Little Blog Dress: Chicken in New Orleans Wine Sauce with Pompeian OlivExtra® Premium Mediterranean blend. Chicken in New Orleans Wine Sauce with Pompeian OlivExtra® Premium Mediterranean blend. There is a running joke that any time that my beau eats a dish that I have made, he begs me to remember that he likes it or he may never see it again. As many cooks do, we love to try many new dishes. I am always scouring new recipes to make although I do have a selection of a couple of tried and trues. 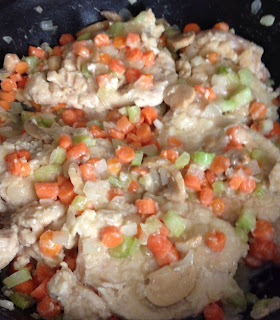 One solid go to on any gloomy or comfort needed day (and one of his favorites) is Chicken in New Orleans Wine Sauce. As we have been looking to eat better before our wedding, I decided to healthy it up using Pompeian OlivExtra® Premium Mediterranean blend. I love this blend that uses extra virgin olive oil and grapeseed oil as well as canola oil. It has great benefits, too as it provides essential Omega-3 and Omega-6, monounsaturated fat, and Vitamin E Antioxidant. Find out more facts from the Pompeian website here. 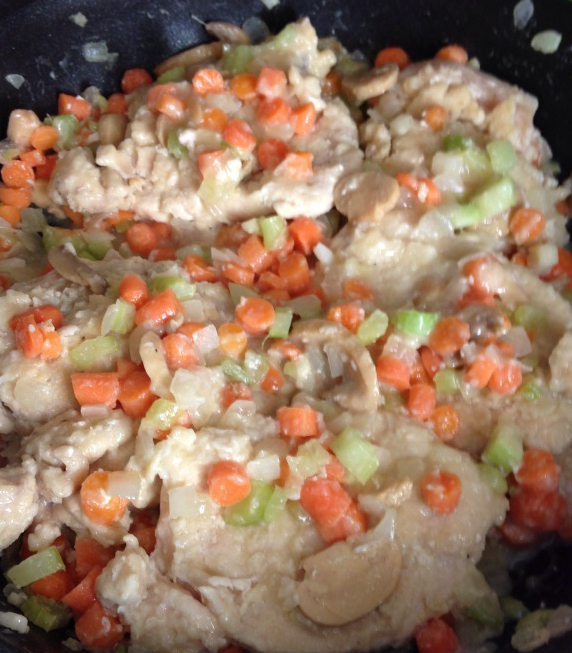 Chicken in New Orleans Wine Sauce starts with a mirepoix which is a combination of celery, onions, and carrots. You can use any kind of wine and just a small amount of flour makes it a low carb, healthy meal. Using the Pompeian OlivExtra® Premium Mediterranean blend added more flavor and made it that much more healthier. Mix flour, salt, pepper and paprika together, use a paper plate to save some dishwashing. Dredge chicken in this mixture. Add 2 tbsp Pompeian OlivExtra® Premium Mediterranean blend in pan and brown chicken breasts both sides. Add remaining Pompeian OlivExtra® Premium Mediterranean blend., stir in remaining flour mixture, add wine and stir until smooth. Add to wine mixture chicken bouillon water, poultry seasoning, bayleaf, mushrooms, onions, carrots and celery. Add chicken and simmer covered for 25- 30 minutes. Once chicken is cooked, remove and add sour cream. When ready to serve pour sauce over chicken and garnish with parsley. #GivingVine Goes Green for Earth Day! April Foodie Pen Pal Reveal!